I feel like my skin has been telling me I've been stressed lately either that or like the rest of my body it hated the long spell of cold weather we had! I've been getting breakouts in random places like my nose where I don't usually get spots these days. My chin has been pretty bad too. In lifestyle terms I'm eating pretty well, drinking lots of water and am finally back to the gym so these will all help. The stress however is a bit more difficult to sort out as a lot of is to do with my chronic pain and it worsening in the cold weather. I'm going to try and take some time out to relax more in the evenings though - rather than powering through my emails or 'to do' list! I think it’s more that just looking after your skin though it’s more of about making yourself feel good, a bit of self love and having some me time can really help to lift the spirits I think. Obviously drinking plenty of water and eating a healthy balanced diet are important as well but I’m doing that anyway. Plus make sure all your make up brushes and sponges are regularly cleaned and you make up products aren't really out of date (often people don't realise that a thing!). So as well as taking time to relax I've decided to put my skin on a bit of a detox program for the next month! This is in terms of products. I really want it to have settled by Summer as that’s when I tend to have fewer make up days. I think if your skin is reacting you’re supposed to go back to basics, keep your routine fairly simple and stick to products you know your skin gets on with. Here are the two key products I’m using to help my skin right now. 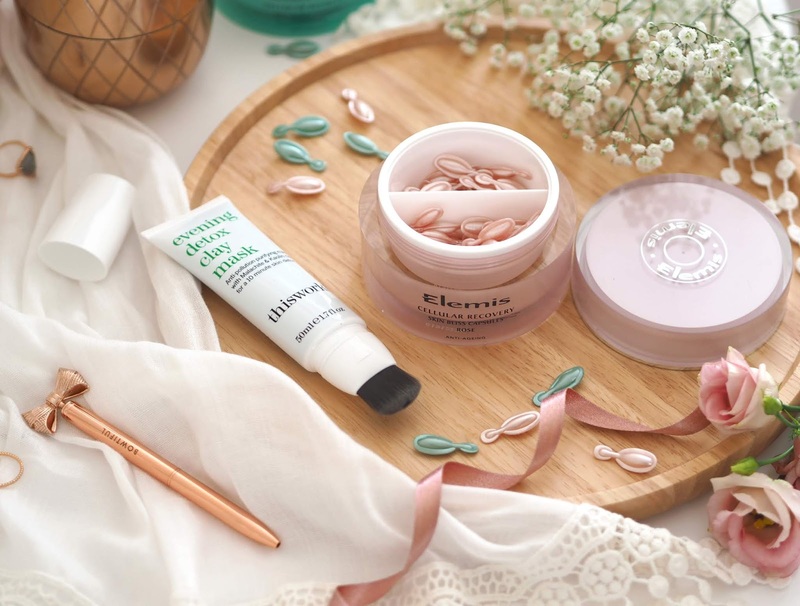 Elemis Skin Bliss Capsules | A product I regular go back to and always enjoy re-discovering my love for is Elemis Bliss Capsules! They’re iconic to the brand and in each pot you receive a months course of capsules, each of these magical little pods contain a measured amount of product that is just enough for what your skin requires. You use them morning & evening after cleansing and toning but before your moisturiser. They contain pure Moringa Oil they are designed to give your skin a 'deep cleaning' and leave it clear, glowing and rejuvenated! Use one capsule morning and evening after cleansing and toning your skin and before your moisturiser. In the morning you use one pink Rose capsule to stimulate micro-circulation and vitality. In the evening you use one green Lavender capsule to repair the skin and encourage a peaceful nights sleep. They usually come in a white pot but I got a 2 months worth Special Edition Set which came in this duo of gorgeous coloured pots. 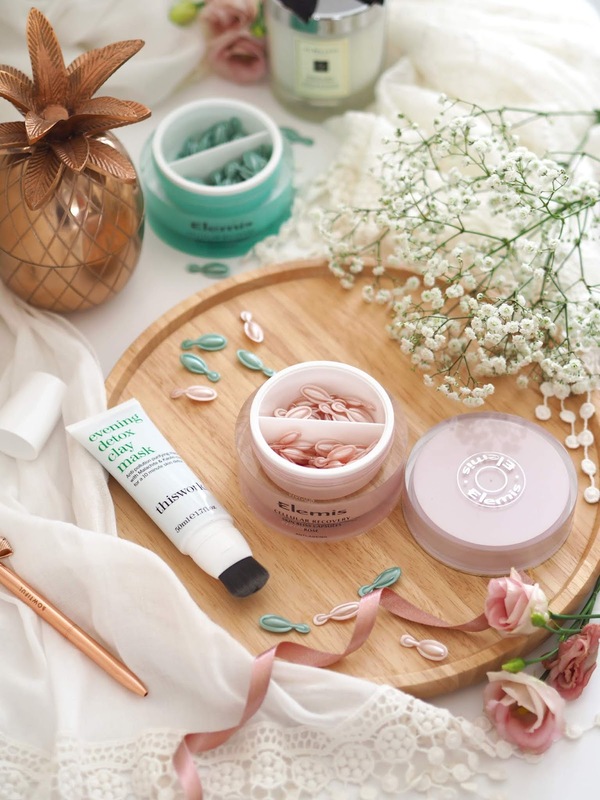 They are perfect to use in the lead up to a big event like a wedding or holiday when you've going to be photographed and want lovely glowing skin! 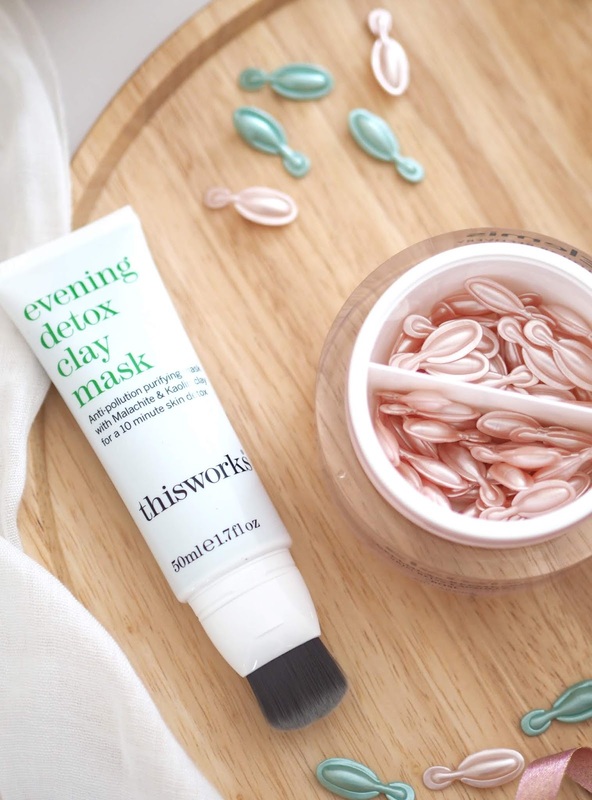 Be aware though that due to their detoxing effects you are likely to get a few breakouts within the first 10 days of use whilst your skin is getting rid of all the trapped bacteria etc. So plan ahead! I haven't used a course of these for well over a year but I've fallen back in love with them. Twisting the little tops, squeezing out the oil, inhaling the aroma and pressing it into my skin it's just such a pleasurable experience. Cleansers | When it comes to cleansers I really like the ESPA Balancing Foam Cleanser or Caudalie Instant Foaming Cleanser in the mornings. Then Liz Earle Cleanse & Polish to take my make up off with in the evenings - they have a really nice limited edition out now actually. Toner | My favourite toners are from Elemis and I like using the Apricot Toner when my skin is reactive as it’s designed to calm sensitivity. Oil | A great alternative oil to the Bliss Capsules would be Caudalie’s Overnight Detox Oil. Which contains lavender oil, neroli and antioxidant grape seed oil. Moisturiser | My all time favourite and go-to moisturiser has to be Elemis Pro Collagen Marine Cream. It’s light weight but really moisturising and packed with amazing ingredients. My skin just loves it and instantly feels calmer when I apply it. I would recommend getting it off QVC when it’s in their product bundle offers as it’s such good value then. Another one I love is ESPA Balancing Moisturiser it's lovely to use in the morning. I’d love to know what your favourite skincare products are right now and what you would recommend using when you’re getting breakouts or stress related reactions? *This post contains PR samples however all opinions as always are my own, please see my Disclaimer for details. These look like some great products.